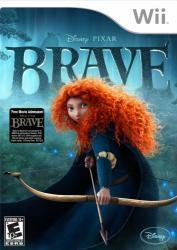 In Disney Pixar Brave: The Video Game, players will be able to challenge destiny and change their fate, while playing as Merida, a Will O� The Wisp and other popular characters from the upcoming Disney Pixar film. Players can run, jump and battle their way through the rugged landscape of mythical Scotland. By utilizing their wits and bravery, players will face off against fierce enemies to end a magical curse and save the kingdom.